Bernard recently completed an M.Phil in Environmental Change and Management at the University of Oxford's Environmental Change Institute. Before moving to Oxford, Bernard worked as a farming apprentice and farm manager in Eastern Canada's Maritime provinces, spending most of his time on small-scale, ecologically-oriented vegetable farms, where he specialized in greenhouse production, heirloom varieties, and chicken-wrangling, among other things. Previously, he worked as a researcher with Dr. Ian Mauro's Human Dimensions of Environmental Change Lab at Mount Allison University, exploring the relationship of local and indigenous knowledge to climate change in the Maritime provinces. Bernard's M.Phil and doctoral theses investigate the impacts of climate change on agricultural production systems in the Maritime provinces of Eastern Canada, as well as possible pathways for transformational adaptation of the food system in the region. He works closely with farmers and other stakeholders to build mechanisms which will help actors speak across levels and sectors; communicate local knowledge; and build adaptive capacity from the farm to the provincial level. 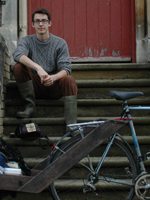 He is also concerned with broader food systems education, raising critical consciousness around climate change, co-operative academic practices, and growing outdoor tomatoes in the English damp. Bernard has led workshops for the Environmental Change and Management MSc, and occasionally teaches seminars on sustainable food systems across Eastern Canada. He also guides workshop users in changing punctures and breaking down bottom brackets at Oxford's Broken Spoke Bicycle Co-Op. Soubry, B. (2017) Comparing farmer observations and modelled projections of climate change in the Canadian Maritimes. Environmental Change Institute, Oxford. Soubry, B. (2017) Food Systems and Climate Change in the Canadian Maritimes. ECI Policy Brief. Soubry, B. (2017) How Can Governments Support Adaptation to Climate Change by Small-Scale Farmers? A Case Study from the Canadian Maritime Provinces. Environmental Change Institute, Oxford.